Welcome to our new tutorial for Dark Basic. This tutorial is aimed at newcomers to the language and deals with 2D aspects. 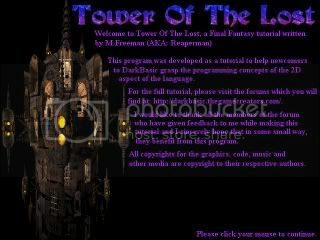 For all those who have ever wanted to program a â€œFinal Fantasyâ€? type game, this is the tutorial for you. As you can see by the above screen grab, the game is very similar to early versions of FF and as I have done before, you will find that the code is simple, uncompressed and easy to understand. I am a little limited on time tonight, so I will be posting links and tutorial text tomorrow, but for now, here is the storyline. You play the character of Hannanoia, a simple farm worker, who lives in the land of Trefoba. One day while you were in your field, you unearth an ancient artefact which, unfortunately, activates and causes a rift to open between your world and a demonic one. Thankfully, you are a strong, and a bright, farm worker, and it does not take you long to realise what is going on and you smash the artefact thereby closing the rift. That would have been the end of it, but evil does not need much time...And in the few minuets the rift was open, an evil spirit escapes from the rift and drifts through the land changing and influencing the minds and characters of the inhabitants. Soon, within a matter of a few weeks, the kingdom was in turmoil. The king was usurped by his General of the guard, who had become possessed by the escaped spirit. Your whole world was turned upside down, as without warning, the army, which was also influenced by the evil presence, came and burnt your homestead and your town. You lost many friends in that day, and you vowed to hunt down the evil and destroy it if you could. You travel the land meeting others who may, or may not, join you in your quest, and the fate of your kingdom lays squarely in your hands. They just get better and better. I might aswell say it now, Thakyou so, so much for devoting your time to helping newbies and even, dare I say it, some of the more experienced coders out there. HEY, YOU THERE, THE ONE READING THIS, WHY NOT VISIT OUR TEAM SITE. Reaper, this is great. Your tutorials always seem to be... awesome! Not to hijack the topic or anything, but I definitely need a tutorial on how to make a game multiplayer. This would definitely help me with my one game, and plus it allow you to make your tutorial games available to play with multiplayer capabilities. Just a thought. Anyway, nice, I can't wait. Sorry for the delay in posting here, but as you know, I have just had to get a brand new computer and it has been having â€œteething problemsâ€?, which really means, â€œIt wont workâ€?. Now I have it under control, I can post again and get access to the tutorial, so its all go today. My thanks to all of you who have waited patiently, and before I post the tutorial (which is in 3 parts as the program is quite large) I will answer the above posts. Zero Blitzt: I definitely need a tutorial on how to make a game multiplayer. Well, I do know that there have been tutorials on multiplayer before, but I was going to include a short tutorial on that subject...So your in luck. Again, your in luck too. However, it is beyond the scope of this tutorial to delve in to every aspect of the above wish list. There are many many many ways to write a Final Fantasy type game, and, for example, our tutorial does not have a â€œmovingâ€? player icon on the world map, but opts for a static icon with a clickable destination. Yes you can, along with about 100 other â€œgame makersâ€? . However, this tutorial is for Dark Basic, on a Dark Basic web forum, for Dark Basic users...So I donâ€™t understand why you mention Rpg Maker...Unless you have shares in it! Quote: "So I donâ€™t understand why you mention Rpg Maker"
I think he was being smarmy. I haven't run either of your tutorials as of yet, but I have looked at the source and do understand what it's doing and when. I just like to look at how other people execute their ideas. If I see a better way of doing something or optimised code, then I've learned something. Keep up the tutorials. Can't wait to see this one. Who said 2d was dead this is gonna rock. I think this should be made a sticky and put in the tutorials and code area. Well, now I have sorted all the bugs out of the new computer and am fully in control of it (famous last words) here is the first part of the tutorial. The first part of the Final Fantasy game is all about the introduction and setting up the game ready to play. The second part of the tutorial will deal with map movement and interaction within towns. 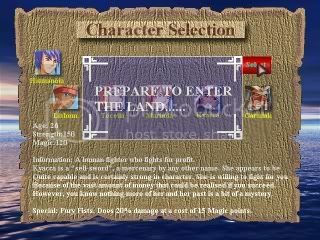 The third and last tutorial will deal with the battle screen and menu system. Also note that even tho the game is complete in its sections, and you can certainly use any of it to make your own game, I will be adding a few little things to the final listing to improve the overall feel and quality of the program, but please donâ€™t wait for me to do that, just dive right in and start playing about with the code. The obvious thing with using just 2D is that unlike 3D you have to put in a LOT of hours in designing graphics and animations etc, so always bair this in mind when changing anything within this program. sync on....Set the redraw to manual. This means that YOU are responsible to refresh the screen within your program using the SYNC command. color backdrop 0.....Colours the background to black. hide mouse....Hides the mouse from view. Ok after that, we need to start to load in the media that will be used for the game. I start with the music and sound effects first. 1. Most people have very good music cards nowadays and the Midi normally will sound just fine. 2. It is a LOT smaller than Mp3/Wav/Mod etc files, and this is a downloadable tutorial which needs to be smallish in size. 3. The Midi tends to invoke a certain atmosphere of nostalgia. Which is just right for our FF game style. After we have loaded the music in, we do the same for the sound effect. Note that the sound bank is 1 and the â€œintro.midâ€? is also 1. Donâ€™t worry tho, as the banks are different and are assigned to either MUSIC or to SOUND...so bank 1 of the music will not overwrite bank 1 of the sound or visa versa. We next set the volume of the sound effect to its loudest, which is 100. This means that you should be able to hear it over the music playing. Finally, we just play the music in bank 1. Ok...so far so good. Now we load in the credits/title screens. There are many ways to do this, but in programming there really is no right way to do anything. Whatever you want to do...provided it works, is acceptable. So we will just use the default screen to display the screens as I merely wanted to show a picture..pause..show another picture..etc. Note that both screens are the same size... 640 by 480. This is important if you are doing the above as if you load in a big screen and then load in a smaller screen you will still be able to see the outer edge of the first screen underneath the second one. Try it and you will see what I mean. After the 6 second pause we load in the simple title screen, with a bit of writing on it from me, and then we load in another screen...but this one is not to the default screen (which is screen 0) it is to a â€œhiddenâ€? screen...in this case screen 1. Whats on it???? Well the hidden screen is being loaded with a screen full of text that we will use later on in the program. One of the things I see on the forum is newcomers always asking how to put text on top of a sprite...you cant do that as such, but you can grab printed text as a sprite. This is what we are going to do later with the hidden text. Anyway... We then wait for a mouse button to be clicked and... Yes, you guessed it...We load in the working background for the introduction. That will store the sky part of the picture in an image bank (just like the sound and music banks). The image bank is 2. The 0,0 means the top left co-ords of the screen and the 640,255 is the far bottom right corner co-ords. I am not going to explain every single one to you..you have to learn by doing you know, ..but suffice to say that the pictures are loaded in to their own banks..96 to 110. We now set up a few variables. These are used in the program to control aspects of it, such as picking your team members etc. See if you can figure out what Iâ€™m doing here. Ok...maybe not.. If you look at the sprite command you will see I am placing a sprite (101) on the screen but it does not have a picture/image assigned to it. Its using an EMPTY bank. Why would I want to do that? Well Dark basic is a great language, but it does have some annoying quirks. One of them is that it has no sprite priority (it does in Dark basic Pro..but not in Classic) so for your mouse sprite to always be ON TOP of all the other sprites you MUST put the sprites on the screen (or off the screen) IN THE ORDER you want them to be displayed. Sprite 101 is used further down the program as you icon on the world map, but if I just introduced it later on, then the mouse would be underneath it, so this is one way to stop that from happening by using no picture and putting it on screen now. On to the screen ready for the next routine. This is a repeat/until loop. You could have used a for/next loop (or anything really) but I wanted to use a repeat/until one..So there! What it does it to move sprite 97 UPWARDS by taking 1 away from the Y variable. This simply scrolls the text upwards but hereâ€™s the fun thing..As the text reaches the horizon on the sky it fades (as the horizon is white and so is the text) and then disappears underneath the other sprite. It looks much better than having the text scroll all the way from top to bottom. When Y is less than 80 the loop ends and we delete both of the sprites. We also reset the refresh rate to 30 to speed up the game. I used a low rate at the start so that I did not have to put a delay into the scroll loop. There are problems with using sync rates to control sprite speed, but in this instance for its purpose, it works. I would NOT recommend you do that tho, its better to use a delay in a loop. Ok...now we bring the nice scroll down on to the screen which will let you pick your team members. The same trick of movement is used as I did with the text..but this is from the top of the screen towards the bottom as we add 1 to Y 8 times (Inc=ADD Y,8= add 8 to Y). This little lot is the main loop. Its another repeat/until loop which will terminate when NOC=2 (NOC=Number Of Characters). SPRITE 1,mx,my,100....We put a sprite with a NEW pointer over the top of the hidden pointer. ucm=MOUSECLICK()....UCM (User Clicking Mouse) is assigned to your mouse buttons. if ucm=1 then gosub clickingon....If you click the mouse button JUMP to a section of code under a label called â€œClickingonâ€?. This is a bit like using old fashioned line numbers, if you remember them? if lis=1 then gosub lisinfo....If you have clicked on Lishoms icon then the variable LIS will be a 1, so the program jumps to another section called lisinfo. The rest does the same thing as the lis one does. Ah...the most important command in Dark basic: SYNC. This will redraw everything on the screen so that you can see things happen. You normally put this at the end of a loop. Right then, what happens if NOC does equal 2? Go on now..I KNOW you can do this. Guess what this routine does. A clue...think of the text and map routine. Ok..we now just pause for 5 seconds and then, using a GOTO command (yes there still is a place for a goto you know) we jump to the main game routine, which strangely enough is under a label called â€œMaingameâ€? The next things you find heading down the listing are the routines for displaying the hidden text. We will look at just one of them, as they are all copyâ€™s of the first one. We set the drawing actions to the hidden screen using the SET CURRENT BITMAP command. This just tells Dark basic that what your going to do next is NOT with the default screen but with the hidden screen 1. We want to grab some text from it, so we use â€œGET IMAGE 98,0,0,535,175â€?, which grabs an area starting from 0,0 to 535,175 and stores it in bank number 98. We then issue a command to put it on the screen using â€œsprite 10000,60,240,98â€?. We then change lis from a 1 to a 0 using â€œlis=0â€? and we return (or jump back) to where we gosubed from using â€œreturnâ€?. And thatâ€™s all there is to it folks. We will be using the hidden screen routine to generate all the text in the adventure game, and while there are other ways to do it, this is one of the easiest ways..IMHO. The clicking on routine is a little more complex, but not much. It looks to see if your mouse co-ords of MX and MY are within a boundary (or zone as its sometimes called) and if it is..AND if you have not already chosen the character for your team (lisom NOT EQUAL TO 2) then it runs the rest of the code within the IF ENDIF statement. The code just sets up variables to do things with. Lis (if you remember) is used to jump to the description of the character. Lishom is used later in the game to make sure you have the right character with your group and click is used to make sure that you have/have not already picked the character and they are in the group and you cannot re-pick them/re-print info. If your not clicking on a character icon, but on the select button, then the routine just checks to make sure that you have picked them and that you have not tried to pick them twice... thatâ€™s what the â€œif click=1 and lishom=1â€? command does. The program then puts a nice â€œXâ€? across the icon to denote you have picked it, and it also adds 1 (inc noc) to the noc variable. Your only allowed 2 characters to join you, but changing that is easy just by changing the noc value in the first main "repeat/until noc=2" loop. It also changed lissom to 2 to stop you picking him again. You have to close the first IF statement and then you return to where you gosubed from. Now there are other ways to pick a group I know, and I will be altering this routine later on when the tutorial is finished, but for now just accept it as it is. Last but not least is the main game loop. We start off by just clearing up any sprites and images we have stored. I used the â€œlazyâ€? way, by setting up a loop and then checking if the image/sprite exists and if it did, then we delete it. The better way is to run through the things you know you did and remove them...but it was late and I wanted it easy! Next we stop the first music and start the second music up. Ok.... now lets reset everything back up again for this part of the program. Donâ€™t be afraid to load and unload graphics etc into a program at opportune times. Its not wrong or â€œbad programmingâ€? to do it..you just have to be careful to do it where it will not effect the running of the game. And we now just put our mouse on screen and go in to a simple do/loop. Feel free to change then so you can see what happens. Stay tuned for the second part of this tutorial...which hopefully will not take forever to put up..lol..
(I promise to put it up for no later than next Friday). ` OK lets reset everything back up again. LOL...no not quite dead yet! Tho I feel like it sometimes. Quote: "i have seen many tutorials before, but so far this is by far the most impressive dark basic tutorial i have seen"
I have a question, the code i understand very well and all, but is anyone else having problems running the sample. Its gets passed all the screens then when it says to click mouse to continue, i do so and it gets to the next screen with the sea picture and then the program just closes and returns me to windows. Any Ideas? Quote: "I have a question, the code i understand very well and all, but is anyone else having problems running the sample. Its gets passed all the screens then when it says to click mouse to continue, I do so and it gets to the next screen with the sea picture and then the program just closes and returns me to windows. Any Ideas?" The code works...there is nothing that could halt it. Have you tried to use the gfx and the posted code to see if you have the same problem as your getting with the exe file? If you still get it, then does it give you any error message when it exits? 1. You were low on RAM and that caused the crash. 2. You need to re-download the exe as it may be corrupt. But these seem to be unlikely...Let me know. nope neither of the above i have a gig of ram so im never low on it. Hmm this program is for darkbasic classic right? Quote: "this program is for darkbasic classic right?" Mmmmm You have me thinking now too. Give me a few and I will get back to you on this. Will this be available in a download, like a .doc or .pdf file? I dont think it will be Ninja. I think its just for this forum, but it would be a great idea. sigh , im starting to get a bit frustrated, for some reason i get to the part in the code where the water bmps appears then about 2 1/2 seconds later my dark basic closes for no reason, and im using db 1.13 with the enhancement so im not sure whats the problem. edit... i figured out something interesting the get image commands seem to be effecting the problem. I removed the first get image command just to see what would happen and to code went forward without the game closing out, so its something to do with that. Quote: ""I have a question, the code i understand very well and all, but is anyone else having problems running the sample. Its gets passed all the screens then when it says to click mouse to continue, I do so and it gets to the next screen with the sea picture and then the program just closes and returns me to windows. Any Ideas?"" Maybe you forgot to put the brackets. You need to put the image number inside the brackets. So you would have Image Exist(image wteva). Quote: "i=image exist(t)but it doesnt work"
lol, i don't have a clue! Location: Rhode Island...State motto: Who Cares? Quote: "I promise to put it up for no later than next Friday." "Hey! HEY! Sir you can't park your car on the - oh...wait...it's not a van, it's just a fat kid!" Erm...Is it possible you could maybe do a tutorial for a platform game in the future.. I to am experiencing the same issue with the executable crashing after a couple of seconds on the big island overview map. I will try the idea that Lord Dario found fixed his problem here. has anyone else had this or does anyone have an ide of what is the issue? Anyway, I expect to be returning here in a very short order, when I grow out of basic shapes stuff and into the more vesitile images and designs. Love your storyline, the basic feel you're shooting for, etc. Look forward to seeing the rest as it comes. Any truly great code should be indisguishable from magic. My Dad has been a bit unwell, AND he has been getting ready to get married! So he sends his apologies, and says he will be posting soon and answering all your posts. What's with the RM2K3 sprites?? RM2k3 sprites look good to me, and fit for this game. It's probely easier than making your own. Don't let life get you down, it will only get better.